That's why I called it "funny". Best Super Bowl commercial this year. Not that it was hard to do, since all the other commercials sucked. Last edited by F-C; 02-04-2019 at 09:17 PM. Finished S2 & started S3 last night. Puts me a couple days ahead of schedule based on the watch calendar posted earlier in the thread. Shouldn't we be getting close to S8 ? BTW, anyone has read/going to the actual books? I read the first 2. I'm thinking about reading them also...I saw a clip interviewing GRRM where he says certain scenes he was looking forward to showing up on TV didn't....so that means there are more stuff in the books. Only problem is TV show will end before the actual book series will....so weird. Always more in the books than the TV version (movie/series). Book 1 = S1 almost exactly. From what I've seen, the showrunners know how the last book ends, so despite all the divergence from the book, they'll end in the same place/way. The eighth and final season of “Game of Thrones”will feature an epic battle so intense, actors collapsed while making it. An unnamed series regular actress even passed out while filming, EW reports. She was fine, but the battle sequence (which will take place at Winterfell) was brutal to film. It’s a showdown between Jon Snow (Kit Harington), his allies, and the Army of the Dead. But this time, it’s not just Jon and his band of not-so-merry men. Arya (Maisie Williams) is involved too, as are Sansa, Daenerys, and Brienne. Aside from Arya and Jon, The Hound (Rory McCann) will be there, along with Daenerys Targaryen (Emilia Clarke), Tyrion Lannister (Peter Dinklage), Arya Stark (Maisie Williams), Sansa Stark (Sophie Turner), Brienne (Gwendoline Christie), and Sam Tarly (John Bradley). The producers say the sequence will feature the largest number of characters together since the pilot episode in 2011. The final “Game of Thrones” season premieres April 14 on HBO. Looks like it's the end for Winterfell. I never watched GoT in those days but I finally got on board at the insisting of a good friend and started watching on January 7th 2019 and finished watching 20 days later. And holy snap it was good. Very excited for April 14th. I started re-watching Season 1 a few weeks ago - again on the insisting of a friend - and am into 3rd season now - and it’s been great and so cool to see all the things I missed the first time. Nearly through S5. May have to binge a bit to keep on track. I've re-watched some of the S1 - S3 episodes, amazing how much was there that I didn't recognize before (or realize the significance of it). They were even more enjoyable the second time. Not at all, I just never watched it then - and a friend suggested that I should, knowing what he does about me. And he was right, I loved it. I see some things never change around here, though. Game of Thrones ” fans have been preparing for a final season made up entirely of feature-length episodes, but unfortunately that’s not going to be the case. Entertainment Weekly confirms the final season of “Thrones” kicks off with two episodes that don’t even break the 60-minute mark. The season premiere, directed by “The Rains of Castamere” helmer David Nutter, clocks in at 54 minutes, while the second episode, also directed by Nutter, will be slightly longer at 58 minutes. 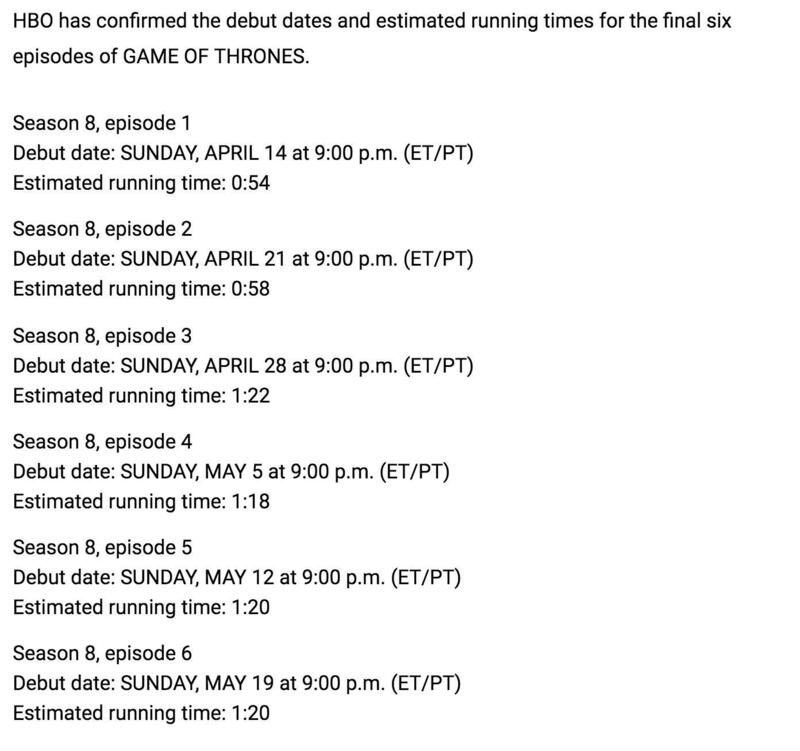 HBO has yet to announce titles for these or any episodes in the show’s final run.Speculation around the runtimes for the last “Thrones” episodes has been raging for well over a year. Nutter himself said last November that all six episodes in the show’s final season would go beyond the hour-mark. “Season 8 episodes will all I think be longer than 60 minutes,” Nutter said. “They’ll be dancing around the bigger numbers, I know that for sure.” Ironically, the first two of Nutter’s final season episodes will be under 60 minutes. Nutter is also behind the camera for the show’s fourth episode. The episode with the battle at Winterfell should be a long one. Article I read last week said the battle sequence in it will surpass the 40 min LOTR Two Towers sequence for length. I feel every episode will be 55-58 minutes then the last and final episode will be the long one. I've done this once before but this show doesn't disappoint, introducing new things that you just keep realizing with every re-watch. Maybe I don't understand the economics (and I probably don't), but I thought that more episodes would be better...? They don't run commercials obviously, but later on they would. More episodes to syndicate one day, more to sell on DVD, etc. I'm trying to figure out why they are trying so hard to keep such a cash cow at the absolute minimum episodes? They've probably filmed enough for 9-10 60 minute episodes. Or is the revenue completely unrelated to the number of episodes? Saw this trick in a Reddit post. Seems legit. They're saving the footage so people will buy the "Special Editions" or "Director's Cut" coming out on DVD. “Game of Thrones” will premiere its highly anticipated sixth season on April 24, but the executive producers say they are considering an abbreviated end game for the hit HBO series. It’s long been speculated that the show would end with season eight; HBO signaled back in January that they were in talks with Weiss and Benioff for two more seasons. Fans might have expected that the two additional seasons would run the usual 10-episode-per-season stretch, but the executive producers say the shorter run will enable them to spend more time per episode. “Thrones” is set to go back into production in July. To live up to the standard they’ve set for themselves — and fans — Weiss and Benioff said they can’t continue to produce 10 episodes of the show in the show’s usual 12- or 14-month time frame. “It’s crossing out of a television schedule into more of a mid-range movie schedule,” Weiss said. While the “Game of Thrones” showrunners said the shorter-episode scenario is their hope, HBO executives made it clear there’s no deal yet in place. “We’re still in conversations,” said Lombardo. ^ May have a lot to do with those actors being pulled in many different directions at this point and HBO can't throw the kind of money at all of them to out prioritize movie deals. 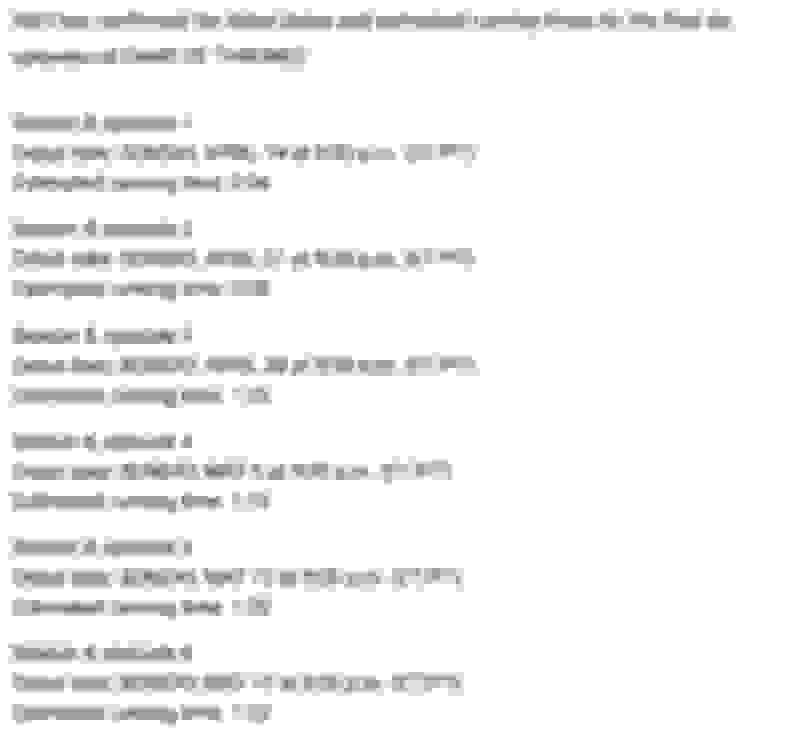 Last edited by Joneill44; 03-15-2019 at 01:41 PM. Meh. Thought they'd be longer. Better not include credits. 1:20, not 120. Which is a slight, but significant, difference. 40 minutes of difference.